Bob Fenner "See me, don't feed me..."
How would you feel if you saw a child about to fall down a well? I get a similar gut-wrenching sensation when I read, see accounts of people attempting to keep inappropriate animals in captivity. Note... I did NOT say animals in inappropriate settings... that is another, much larger matter, category altogether. Of fishes that should be "off-limits" to home hobbyists, the very large and/or very active marine sharks are the most extreme example of "inappropriate animals"... It is just outright cruel to subject them to short, dismal, likely painful existences for... temporal amusement? You are assured (by me) of a tongue-wagging should you simply "buy" these sharks "because you want to"... and "can afford it"... CAN you afford to build and maintain a system of several tens of feet in diameter? To feed these animals for decades? I have yet to come across anyone with full-knowledge, OF REASON, who goes forward with keeping large and/or active sharks. A bold example here is the Nurse Shark, Ginglymostoma cirrhatum... 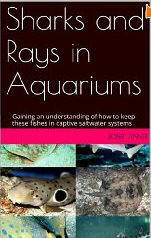 STILL sold in aquarium stores... take a look on fishbase.org re this species... what's the maximum length recorded? 430 centimeters... yes, 4.3 meters... more than sixteen feet... "Oh, but it will only grow to the size of the system it's in". Wrong... it will die from stunting, if metabolite poisoning or jumping out don't occur first... "Oh, I'll be careful to only feed it so much as to keep it small"... Fat chance... this doesn't happen either. See the above example of a starved specimen. Though the Nurse Shark is largely sedentary, sitting on the bottom a good ninety percent plus of the time, it does occasionally get up... and sometimes really GO! They need BIG tanks... tens of feet across even when small... round sided... to prevent injury... and jumping out! The direct and indirect effects, physiologically and psychologically of being in too small a volume of water are responsible for the vast majority of deaths of this fish. Of course, to go with these tens of thousands of gallons of water, you'll need large pumps and filters that will have to run continuously, and unless you're in a tropical to sub-tropical setting, some way to keep the water heated. The common name "Nurse" pertains to these fish's prodigious sucking capacity... they can literally vacuum up a food item that is proximal to their underslung mouths... much like "suckling" a baby. Only Ginglymostoma specimens that are very sick will refuse foods of all types... live, prepared, dried... if it's detected, it will very likely be sucked in... Folks in the know will utilize a diverse diet, and supplement this with a shark-formulated addition (e.g. Mazuri.com). I would not be surprised to find that poor nutrition is the second cause of loss of this species in captivity. How much food? For small specimens (under two feet total length), some food can be offered daily... but take care! As stated, Nurse Sharks will "keep eating" seemingly "until they pop"... this is assuredly not good for them... or you. An overfed specimen is not healthy, will grow too quickly, and make a great deal of nitrogenous waste. Yours is TOO Big! Now What? Don't count on public aquariums to take in your too-large Nurse Shark... they have plenty... and they live a good long while with proper care. DON'T think of releasing yours to the wild either... this is a VERY POOR idea. What's left? Humane euthanasia... not a very fitting end. So, are you still determined to "try" this species in captivity? Do you know what is involved? Are you prepared to make the commitment in time, money, space... personal involvement to insure it a healthy life? If not, please leave these animals in the sea... go visit them in the wild, in large public aquariums... "If a man would be unkind to his parrot, then why not his country...." from Pliny the Elder... I would further add ... If a person would so shoddily treat the life around them, what does this say about their love of their own life? Shark keeping is not a "life-style"... It IS a matter of choice. Something to think about. Nurse Sharks, family Ginglystomatidae. Coastal Atlantic, Pacific, Indian Oceans. Three genera, each with one species. All too big for aquarium use... Nurse sharks. Probably the most popular, frequently offered shark in the U.S. as it occurs commonly along the Eastern seaboard Rhode Island to Brazil. Their only real downside is that they get big (maybe fifteen feet), quick (a foot or two a year). Feed sparingly, infrequently. Ginglymostoma cirrhatum (Bonnaterre 1788), the Nurse Shark. Most often collected out of the tropical West Atlantic as the most commonly (mis)offered shark species for aquarium use, though found in the Eastern Atlantic and Eastern Pacific coasts. To at least fourteen feet in length (not a misprint). Unbelievable to me that folks would offer or buy this animal in place it in tiny systems. Jumps out or dies unhappily... Bahamas and public aquarium images.